The ancient Abbey of Saint Robert sits 3,500 feet above sea level in La Chaise Dieu, a tiny village in southwestern France. Deep in the vast Livradois forest, it’s a colossal stone structure in one of France’s wildest, least-populated regions — a surprising setting for the major international festival of classical music staged there every August for the last 48 years. Still, festival director Julien Caron expects 25,000 people to come to this isolated outpost again this August to hear world-class artists like pianist Anna Queffélec and rising cellist Edgar Moreau. They’ll be performing in the abbey or one of the festival’s satellite sites — mostly other 11th century churches in towns around the Livradois. This year’s program has rich offerings in all three categories. Music of Bach, Handel, and Scarlatti, all born in the same year (1685), is featured, but there’s a sharp focus on Beethoven, too, with performances of his Second and Fourth Symphonies and the highlight: the Royal Philharmonic Orchestra of Flanders playing his Ninth Symphony, its “Ode to Joy” soaring to the heights of the medieval abbey. This year’s event is August 21-30. Buy tickets at www.chaise-dieu.com, and get a list of recommended hotels and B&Bs at www.la-chaise-dieu.info. (La Chaise Dieu itself has only 750 people, so you may need to book a room in other towns 30 minutes away.) 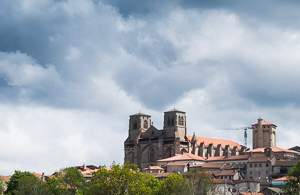 Get to the village by flying to Lyon or Clermont-Ferrand and renting a car to take you (by Road D4 or D499) to the Abbey Saint Robert.